Does he dream of thorns? I’m now entering the fourth week of working on the habit of playing with my cat Fox in the evening, So I thought I would give an update on my habit formation. In some sense it’s a bit early. Four weeks is a good time to work on an easy habit if there are no problems. However, there were some problems with this one, as I missed a couple days in the second week. However, while I am perhaps not fully trained in this habit, Fox definitely is. He knows that evenings after I work on the computer is play time. If I forget, he makes sure to remind me. If you’ve ever had a cat, you know that their favorite toys are often the really cheap ones, like a cardboard box or a crumpled up piece of paper. As evidence of this are the above pictured foam soccer balls, Fox’s favorite toys. They’re a buck or two for a tube of four. 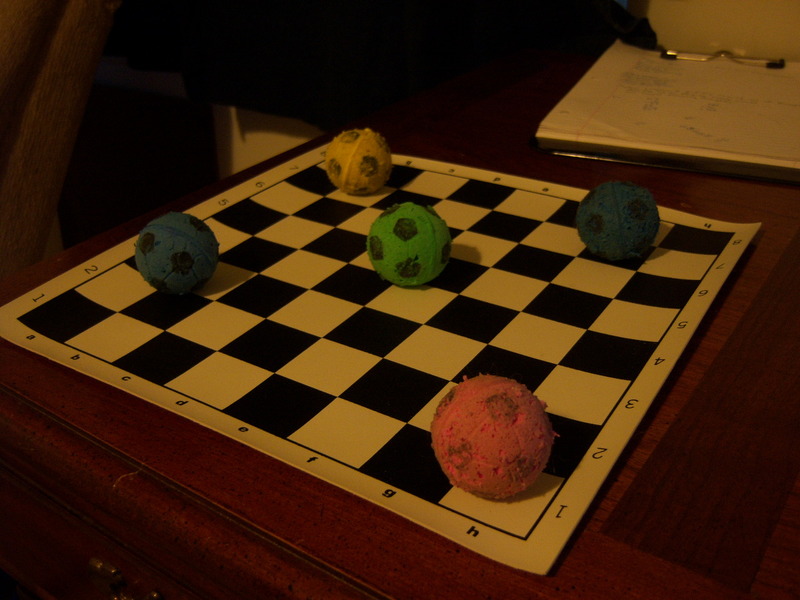 They’re great because they roll well on a carpet, unlike the plastic bell filled balls you usually get. Additionally, he can bite into them and pick them up. Fox will actually play fetch with me, bring back balls that I throw so I can throw them again. Why then, might you ask, have I not spared a buck or two to get him some fresh balls that aren’t so ratty? It’s been about five or six weeks since I started work on my habit of getting up on time, and I thought I’d post a quick update on where I am. The Chess tactics problems habit is still chugging along after last night. It’s now up to 12 days, 85 minutes, and 146 chess problems. However I’ve been rethinking the long term plan for further habits. The problem is that in the old plan the third habit was changing my sleep patterns. Changing your sleep patterns is something the teachers of the Habit Course consider a hard habit to change. They recommend that you make a few easy habit changes first before tackling the hard ones. Of course, I’ve already conquered the hard habits of quitting smoking and quitting drugs. But that wasn’t using their method, so I’m going to try and stick (generally) to their program. I was in the kitchen watching my cat Fox and my rat Hermes wander around on the floor, which was covered in cat litter. Hermes had been a really good rat, so I decided to give him a treat. I unwrapped a fun size Almond Joy candy bar and put it on the floor for him. Almost immediately after I did it I remembered that rats can’t metabolize chocolate, and the candy bar would be poisonous to Hermes. So I quickly picked it up off the floor. I turned around and carried the candy bar (now encrusted with cat litter) into the living room. There was no furniture in the living room, but there was a furry cockroach about the size of a large kitten. It actually looked more like a grasshopper than a cockroach, except for the black color, and hopped around like one. Mind you, four feet hops from a furry cockroach are rather frightening at close range. Despite it’s similarities to a grasshopper, I was clearly seeing it as a cockroach in the dream. I remember seeing that there was an overturned glass on the floor, and thinking that someone must have put the glass on top of the cockroach, and cockroach must have knocked it over and escaped. However, I couldn’t reconcile that assumption with the fact that the glass was smaller than the cockroach. The cockroach scuttled into the den, where my old futon bed was on the floor. He scuttled under the mattress and I could see his movements under the covers. I ran into the den and jumped up, planning to stomp the futon and squash the cockroach. But at the last instant I hesitated and landed with my legs spread just enough to spare him. I didn’t want to kill him because he was so cute. The image of the cat litter on the floor is from the night before, when I realized that the floor around the litter box in the bathroom is covered with cat litter. The fun size almond joys are from work. One of the toxicologists keeps a bin of small candy bars for people in the office to eat if they want, including Almond Joys. I’ve been eating more of them than usual because of the stress of dealing with the new system at work. For those who don’t know, Hermes died almost two years ago. I don’t know where the large furry cockroach comes from. The bit at the end makes me wonder if it’s a metaphor for a woman who dumped me in a very painful way, but that I still care for. But I wonder about reading that deep into a dream.